Isn’t it a beauty? 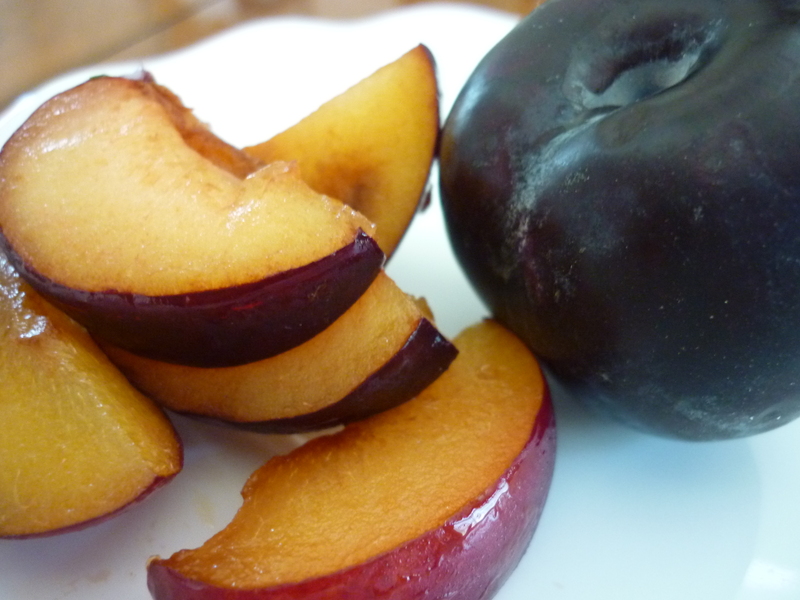 This plum küchen is made with Italian plums which really shines with its variations of red color. When you bite into this, you have a nice balance of tart and sweet, and it really works. You can find a cake like this in any of the finest Viennese café houses, and guess what? it’s really easy to make! Trust me – no special equipment required – just 2 bowls, measuring cups, and a wooden spoon. If you don’t know what an Italian plum looks like, it looks like this. Notice how dark purple the skin is. The seeds are really easy to remove. I actually sliced this plum the day before and it changed the skin color to more of a red color. So don’t look at the sliced plum in this picture; look at the whole plum, please! 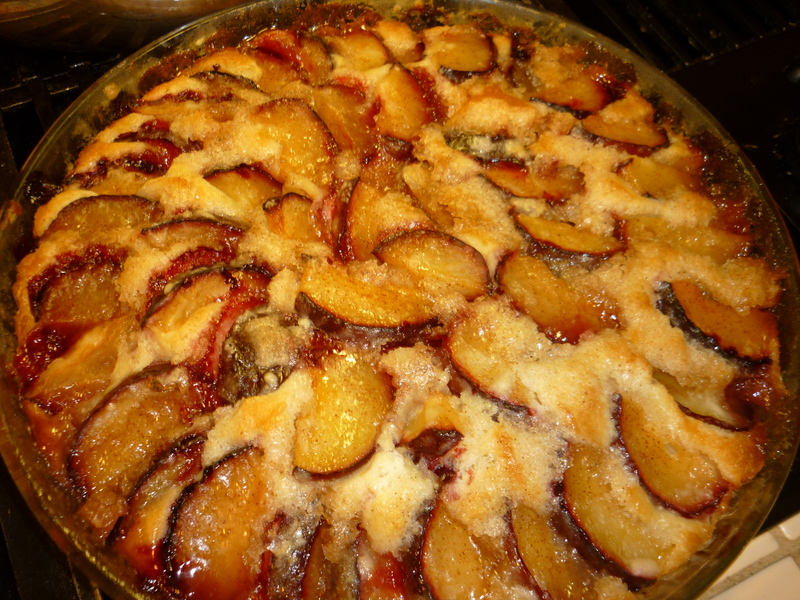 My advice is to slice the plums when you are ready to bake it in the oven. These were actually leftover from the first cake I made from the day before. I changed the recipe a bit. 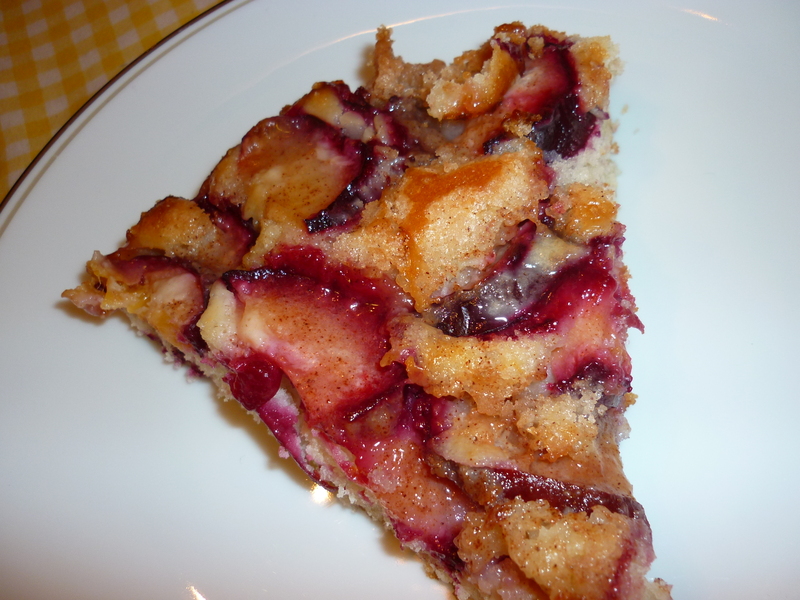 I like a sweeter cake dough, so I used 1/2 cup of sugar, and I used an 8 inch pie plate and arranged the plums in a circular pattern starting on the outside and working in (all the slices facing the same direction). That’s how I’m used to seeing it. Oh, and I also decreased the amount of cinnamon because I only want a hint of it. It’s such a smart recipe and versatile. Try substituting a big can of peaches or apple or cherry pie filling for the plums if you need a change or if there’s unexpected company coming over and you need to serve something in a pinch. 1. Heat oven to 400 degrees. Grease an 8 inch pie plate with butter and dust with flour, set aside. 2. Whisk together flour, 1/2 cup sugar, baking powder, and salt in a medium bowl. Add 4 tbsp chilled butter and rub into flour mixture until pea-size pieces form. In another small bowl, mix together milk, vanilla, and egg; add to flour mixture and stir with a wooden spoon until just combined. 3. Transfer dough to prepared baking dish and spread over the bottom of dish; arrange plum slices (in the same direction) on top of the dough starting at the perimeter and work your way in. Melt 3 tbsp. butter, then add 1/2 sugar and 1/4 tsp. cinnamon and mix well. Distribute evenly over plums. Bake until browned and bubbly, about 30 minutes. Let cool slightly before slicing and serving.